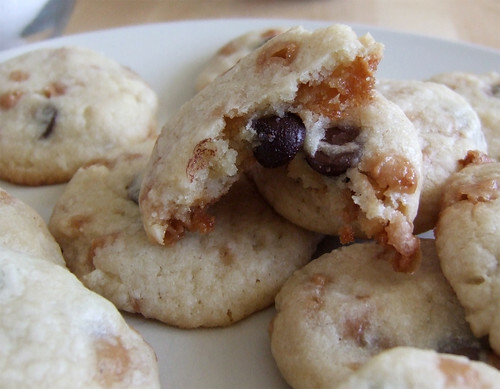 **WARNING: These cookies are highly addictive. What's more perfect than a plate of warm cookies fresh from the oven? When you can share it with your best girlfriends. It was a girls' weekend two weeks ago when I went to visit my friend. She recently bought a house with her fiancé so we made the trek out to see her new house and go over details of her impending nuptials. Girly weekend indeed! But in between talks of flower arrangements, cake toppers, bridal showers, and more, we needed some sweet treats. Thankfully I had thrown my hand-mixer into my suitcase, having a feeling it would come in handy at some point during the weekend. 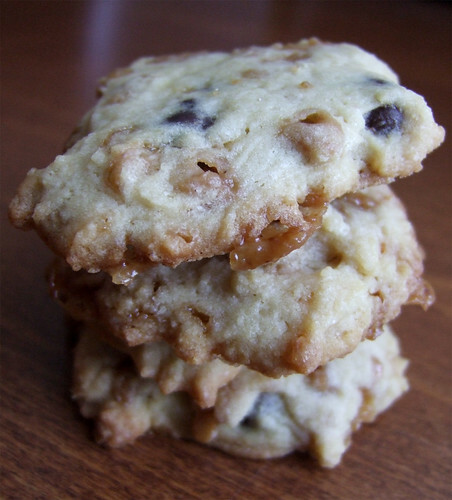 I first came across this recipe when Dara of Cookin' Canuck accidentally tweeted the wrong link for a different cookie. Lucky for me though, I clicked on the link and was instantly drooling all over my keyboard. As Joey from Friends would probably say at a time like this, "Toffee, good. Chocolate, good. Cookie...gooood." Yeah, my sentiments exactly. There's a lot of sugar in the recipe so I cut out 3/4 cups of it and threw in some semisweet chocolate chips to help balance the sweetness (and also add some chocolatey goodness to them as well!). If you allow the dough to rest in the refrigerator for about half an hour, it'll stiffen enough to allow you to roll the dough into balls and flatten them with your ball. You'll get perfectly round cookies this way. Or if you can't want and need that cookie fix quickly, just drop them onto a sheet like any drop cookie for a more rustic look. These have become one of my favourite cookies now. I've already made them twice in one week! They will definitely be part of my cookie repertoire from now on. Place an oven rack in the middle position and preheat the oven to 350˚F. Line two large baking sheets with parchment paper and set aside. In a separate large bowl, beat the butter and sugar with an electric mixer set on medium speed until the mixture is creamy and fluffy, 3 to 5 minutes. Beat in the eggs, one at a time, and the vanilla extract. Turn the mixer to low speed and gradually beat in the flour mixture until it is just combined. Using a rubber spatula, stir the mixture a few times to make sure all of the flour mixture is incorporated. Mix in the toffee bits and chocolate chips. Cover with plastic wrap and let the cookie dough rest in the refrigerator for at least half an hour. Roll dough into 1 1/2-inch balls, place on a baking sheet and flatten with your fingers or with the flat bottom of a glass to 3/4-inch thickness. 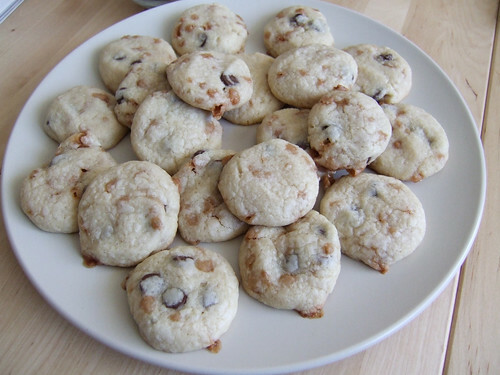 Bake the cookies, one sheet a time, rotating from front to back halfway through baking, for 10 to 13 minutes, or until the edges are set and beginning to colour and the centers of the cookies are still soft and puffy. Remove the cookies from the oven and let them cool on the baking sheet for 5 minutes. Using a spatula, remove the cookies from the baking sheet and let cool on a rack. They can also be served warm (and are simply divine fresh out of the oven. Us girls went through half the batch in one sitting!). Alyson February 27, 2011 at 12:04 a.m.
You cannot go wrong with toffee. Bonita March 8, 2011 at 9:20 p.m.